I have to admit that I am absolutely amazed by my advancements in the kitchen. Many people that share recipes have been in the kitchen for years perfecting their craft. I, on the other hand, was deathly afraid of the kitchen. When I was younger I always managed to be engrossed in homework or playing sports if my mom needed some help in the kitchen. Therefore, I was extremely aware of my lack of culinary skills and avoided the kitchen like a plague in the beginning of my marriage. Joe was the chef the in the house. I reached an impass with the my culinary path once I realized that I loved food. I loved to try new things and how could I expect Joe to cook different recipes that he was unfamiliar with. Luckily, there was inspiration out there and it has only gotten better with the advancement of technology. Now, it’s a simple app that’ll let me pin a recipe for future use. Thus far, I am most proud of this Strawberry Mascarpone Cheesecake. I made this dessert for Christmas and my grandmother, who is from the Bronx, stated, “It’s like a real New York Cheesecake.” Her expression was absolute amazement because she remembered the time that I made the mush brownies in high school where all I needed to add was water to a mix and I added a cup extra. I’m telling you, the kitchen was not my forte. I combined and tweaked two different recipes for this cheesecake. I was inspired by Chef Dennis Littley to try using the mascarpone cheese, rather than just cream cheese. Let me tell you, it was a little slice of heaven. You can find his original recipe here. I used a different topping from Chef Littley. I’m not a fan of gelatin, which was my reason for finding a different recipe. I once again tweaked a recipe from Taste of Home. The Strawberry Mascarpone Cheesecake was not too sweet and it definitely was not an overpowering taste of cream cheese. A perfect combination. I can tell you that this cheesecake was much easier than my first, which you might have read about when I shared my Raspberry Cheesecake Cupcakes. The biggest difference was the purchase of a springform pan. For heaven sakes, make sure you have one of these if you plan on making a cheesecake any time soon. It takes all the stress out of the process. 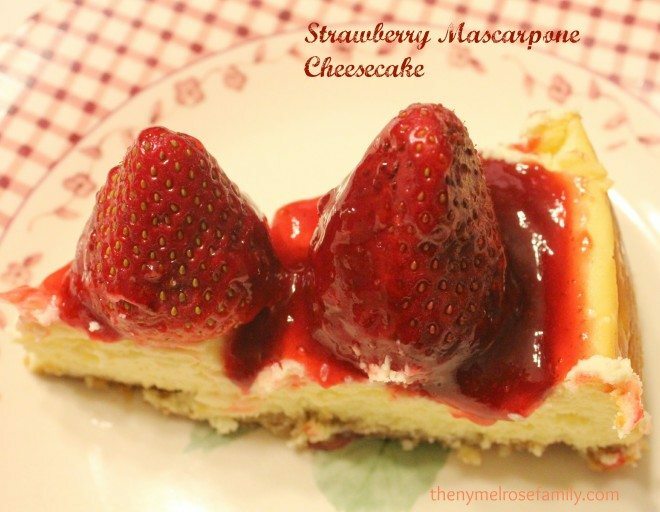 A cheesecake made with Mascarpone Cheese and a strawberry topping that is sweet, yet light. Spray the springform pan with baking spray. Combine the graham cracker crumbs and melted butter in a bowl. Place a layer of the combined mixture onto the bottom of the pan. Place the springform pan onto a baking sheet and bake at 325 F for 10 minutes. In a bowl beat the cheeses, sugar, lemon juice and extracts. Add the eggs one at a time a lightly beat. Pour over the crust. Bake at 325 for 50 minutes. Cool for ten minutes on a wire rack and then run a knife around the edges. Let cool for another hour. Refrigerate overnight or a minimum of 6 hours. Begin to prepare the glaze several hours before serving the cheesecake. In a saucepan combine the cornstarch and water until it is smooth. Add the jelly over medium-high heat, stirring constantly until it begins to thicken. This process should take about 10 minutes. Once it has thickened remove from heat and add the lemon juice and red food coloring if desired. 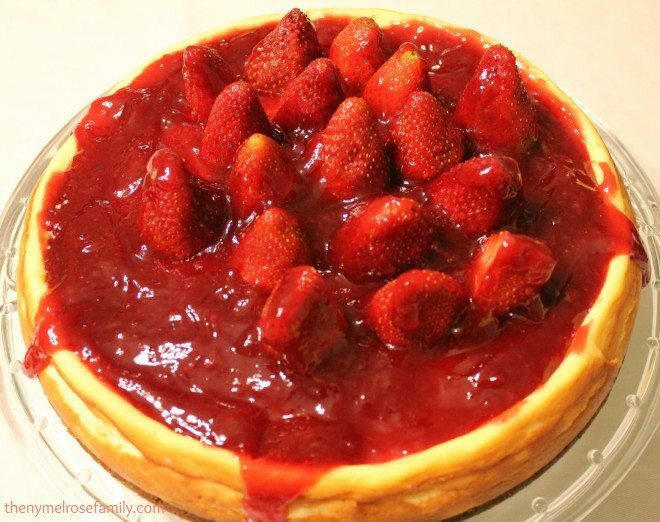 Just before serving arrange the hulled strawberries on top of the cheesecake and spoon the mixture over the top of them. Serve immediately. It looks delicious, Jenny! I love good cheesecake. Thanks so much Randi. Unfortunately, I do too! mmm! Looks so, so good! This gets me excited for spring! This looks so good, cheesecake is my biggest weakness ! This looks delicious! I would love to have you share them over at my new Pinterest Power Party! I definitely feel like my cooking has improved too. I’m happy to hear that the cheesecake came out well Jenny, and thank you so much for the shout out!